Para-ecologists, supported by the UK government's Darwin Initiative, are collecting vital data about the rainforests of Papua New Guinea and contributing to the protection of important wildlife and habitats. Today (Thursday 21 March) marks UN International Day of Forests and is a time to celebrate individuals working hard to protect the planet’s precious trees and forests. Introducing: para-ecologists, the paramedics of the rainforest. This new generation of data collectors and support scientists – just like paramedics – are proving vital to the overall health of the rainforest ecosystem thanks to projects funded through the UK government’s Darwin Initiative. Since 2001, the University of Sussex has led five projects designed to train and build scientific knowledge of nature with local people and received almost £1 million in backing from the Darwin Initiative, with some UK aid, over this period. The rainforests in Papua New Guinea are home to an estimated 25,000 species of plants, along with 760 bird species that are found nowhere else on Earth including the iconic Birds of Paradise, tree kangaroos and many other creatures such Queen Alexandra’s Birdwing butterfly. 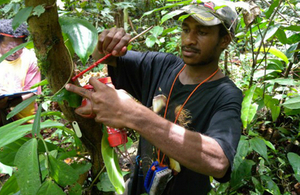 The projects in Papua New Guinea have raised awareness of nature and the importance of protecting biodiversity amongst the local indigenous communities and led to increasing concern for the long-term future of the rainforest. We use the name ‘Para-ecologist’ as analogous to Paramedic. These dedicated people are helping us to carry out vital research work on species of plants and animals, many only found in Papua New Guinea. It is heartening to see that our training programme has impacted local people’s lives to the extent that a large area of rainforest is being protected from destruction – by the very people who live there. Darwin Initiative support has been absolutely essential to establishing these projects and helping to change and shape people lives. The Darwin Initiative is a grants scheme that helps to protect biodiversity and the natural environment around the globe. Many of the applications reflect the UK government’s 25 Year Environment Plan commitments, to secure the benefits of nature for the poorest communities, and to help prevent the extinction of species.